The storms obey: does God care? While the storm raged, Jesus lay sleeping in the stern upon the cushion that was customarily kept under the coxswain’s seat for those who were not involved in the actual sailing or fishing. The other’s aboard are having a much different experience. Given that at least four of the disciples were professional fishermen and must have experienced such storms before, their anxiety/terror indicates the severity of the incident. The usual pattern for a deliverance from a storm at sea involved a plea to the deity for help, but Mark’s version lacks such a formula. In Matthew the disciples’ words to Jesus to fit the anticipated pattern, “Lord, save us! We are perishing!” (Matt. 8:25). In Mark, however, their cry carries an edge – rebuke? Disbelief? Incredulousness? It is hard to assign a meaning that leaves the disciples other than accusing Jesus of being indifferent to their plight. 39 He woke up, rebuked the wind, and said to the sea, “Quiet! Be still!” The wind ceased and there was great calm. It is such a sparse telling of the story that it is not hard to imagine Jesus awaking, being somewhat chagrined (a good night’s sleep is hard to come by), glancing to the storm, wondering what all the commotion is about, and directing the sea to “Quiet! Be still!” As suddenly as the storm had come it had subsided, subdued by Jesus’ sovereign command. However one imagines the scene, the question of what was involved in the stilling of the storm cannot be avoided. Jesus’ power and sovereignty was demonstrated in the stilling of the roaring sea and the silencing of the howling wind, strongly echoing God’s intervention in to history with the parting of the Red Sea. And at the same time the cosmic overtones should also be attended to. The same language used when Jesus rebuked and silenced the demons is repeated here with respect to the sea. When Jesus calms the storm, he speaks to the wind as though to a demon (cf. 1:24). Just as the sea monster in ancient mythology represents the powers of evil, so also the raging storm here reflects all the powers of chaos and evil. Jesus’ power and sovereignty are evidence that he is stronger than the inherent evil represented. After quieting the violent storm with a word, Jesus turns to his disciples (and Mark’s readers) and asks: “Why are you terrified? Do you not yet have faith?” (v. 40). The first disciples’ only response is: “Who then is this?” (v. 41). This passage continues to reveal Mark’s theology of discipleship. These very same disciples who have been chosen in 3:7-12, who have been given the mystery of the kingdom of God (4:10-12), and who are privileged to hear Jesus’ teachings and explanation (4:34) are here chided for their timidity and lack of trust, their lack of a deepening faith. The question of their faith is abrupt at this point in Mark’s gospel. Increasingly as Mark’s gospel continues this question of faith continues to arise. The commonly accepted date for the authorship of this gospel is 69-70 AD. It is easy to see how Mark’s, suffering under Nero’s persecutions, need to be assured with the story of Jesus’ entire life, death, and resurrection, and thus assured of his protection in their times of stress and confusion. He asks for more than “great awe” (v. 41) at Jesus’ stilling of the storm. He asks for deep here-and-now faith from all who struggle to understand the meaning of Jesus’ life, death, and resurrection in their own daily experience of Christian living. Mark 4:35 other side: For most of our parishes, we don’t have to go anywhere to “get to the other side.” The “Gentiles” have moved into our neighborhoods — but what a storm it usually creates when a parishioners makes an intentional effort to reach out to the unchurched — to the people who are “different” than they. Mark 4:37 a violent squall came up. The Sea of Galilee is surrounded by hills except in the southern area, where the Jordan River exits. With certain wind patterns, air can funnel up into the lake and get trapped, creating quick and violent storms (lailaps megalē anemou suggests a sudden tornado-like whirlwind descending from above). That apparently happened in this case. 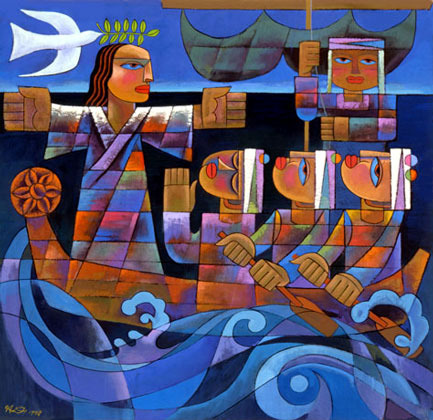 Key biblical scenes involving storms and seas include Exod 1Mark 4:21–31; Ps 107:23–32; Jonah 1:1–16; Acts 27. Mark 4:38 asleep. Jesus was probably sleeping in the stern of the boat at the helmsman’s station where there was some protection from getting wet. The cushion may have been a sandbag used for ballast (Marcus 2000:333). His sleeping may indicate his calm trust in God (Ps Mark 4:8). Here is Mark’s first description of discipleship failure. Teacher, don’t you care that we are perishing? Ou melei soi denotes an urgency in this context. This question uses the negative particle ou and is asked in a way that makes it clear that the disciples knew that Jesus cared about their well-being despite the tone of their question. The conflict shows their panic. Many commentators hear an echo of the story of Jonah who also slept in the midst of a raging storm. The description of the situation and a number of verbal parallels lead some to suggest that Mark had the story of Jonah (1:1–17) clearly in mind (cf. Jonah 1:4 with Mk. 4:37; 1:5 with Mk. 4:38; 1:6 with Mk. 4:38; 1:11 with Mk. 4:39; 1:16 with Mk. 4:41). Mark 4:39 rebuked the wind and said to the sea. This language is similar to that of an exorcism (1:25). Jesus’ authority extended over creation and provoked the reflective question of Mark 4:41. In some parts of the ancient world, the waters were associated with evil. Quiet! Be still! This command is literally “Be muzzled” (Deut 25:4, LXX; 1 Tim 5:18), but the translation picks up the effects of the muzzling: silence and peace. Mark 4:41 great awe. The more literal translation retains the Semitic idiom in the Gr. “feared with great fear” (Jonah 1:10, LXX). Jesus’ great authority left them in awe. Even the wind and waves obey! The remark points to Ps 107:29 and Ps 89:8–9. Jesus’ actions revealed that he had divine control over creation. That such authority resided in a person left the disciples stunned. It raised the question of who Jesus was. By stopping the scene here (creating an “open ending”), Mark leaves the reader to ponder the answer to this question. This entry was posted in Scripture and tagged mark 4:35-41, storms, the other side by Friar Musings. Bookmark the permalink.